The former Leinster 10 spoke about the merits of the Premiership, shifting in to 12 and defensive adaptations. JIMMY GOPPERTH’S TIME with Leinster wasn’t exactly the happiest era for the province. But it wasn’t for the want of effort from the Kiwi. The Taranaki native was called to the eastern province to fill the void left by Jonathan Sexton. Joe Schmidt took Ireland’s call before he arrived in 2013 too, but he remembers the two years that followed fondly. The people, the Pro12 title, the Champions Cup runs, all positive memories in his book. Just as well, because the out-half hasn’t exactly been allowed to push his former to the back of his mind since moving to Coventry. The New Plymouth man missed out on Wasps’ last visit to Dublin, a season-shaping 6 – 33 home defeat for Leinster in the shadow of the World Cup, after he picked up a suspension for a flailing arm hit on Matthew Tait, But he looked completely at home by the time the return fixture came around in January of last year, scoring 19 of Wasps’ 51 points. He’s settled in quickly again. like most who play in the Aviva Premiership, he can draw little comparison to the Pro12. Rugby’s top English tier has adopted a similar mythical quality to its footballing equivalent. “The Premiership on the whole is a lot stronger than the Pro12,” says the 33-year-old. “Week-in, week-out it’s like Leinster v Munster every single week over here. Not to mention some outstanding players. Dai Young’s side are the leading try-scorers in the Premiership with 73, just seven more than second place Exeter Chiefs but 19 more than champions Saracens after 18 games. It’s easy to see how they go about their business: behind powerful ball-carriers they possess raw pace and electrifying runners out wide. And offering the vital link in between has been Gopperth, somewhat mirroring England’s use of Owen Farrell at 12. With Danny Cipriani slotted in to the number 10 role, it makes sense to see Gopperth chosen as the second five-eighth. He was a robust out-half in Leinster colours, able and eager to lay down physical markers with powerful hits where other out-halves would expect protection. It’s a setup Gopperth is enjoying, though he still sounds like a man who wouldn’t mind holding the reins himself. “We had a few injuries early days in the 12 position (so) Danny and I ended up working really well together. Not just two, in fact, Kurtley Beale – who has played across the back-line at international level – offers a third set of distributor’s hands from fullback. So of course, the aesthetics of some Wasps matches has been the victim of the team’s success. Nobody wants to play at someone else’s pace and or get into a straight foot-race when better suited to an arm wrestle. Gopperth takes it not only as a compliment, but as a positive, because it has forced the former London-based club to adapt. “We’ve seen a lot more teams holding on to the ball or trying to pin us back in our half really early. It’s been very good for us,” insists the New Zealander. “We’ve had to vary our game up and approach games differently over the last month or so. “We know what teams want to do, we know they want to slow our ruck down. we know Leinster are going to come very hard at the breakdown — whenever teams want to play quick that’s the number one priority. Email “Premiership 'like Leinster v Munster every single week' -- Gopperth”. 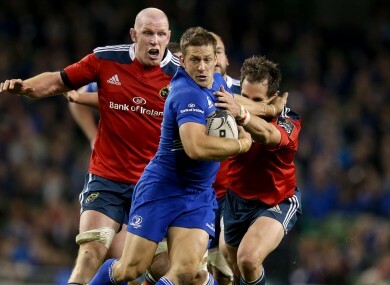 Feedback on “Premiership 'like Leinster v Munster every single week' -- Gopperth”.